It's 'battle of the beat-'em-ups' on the Amiga at the moment and there's yet another contender that fancies its chances. Tina Hackett referees. I'm confused. A game arrived in the office and it's by Delphine - so it's got to be a quality adventure game, right? Wrong. Okay, so it contains a basketball star, Shaquille O'Neill, so it must therefore be a basketball sim? No, wrong again. It's a beat-'em-up. Am I missing something or would someone please tell me what on earth a basketball star is doing in a beat-'em-up? I mean, have all the norms of licensed games gone completely out of the window? It would seem so. Even from the box cover things are already looking pretty cheesy. Said basketballer is in 'menacing' pose and the slogan underneath reads 'Enforcer of Justice'. Cheesy? Most definitely! However, putting all initial doubts aside, I decided first impressions aren't always right and decided to take a closer look. Long ago in a far-off place called The Second World, there ruled an evil sorcerer, Sett Ra. And like all bad guys, he's gone power-crazy and intends to take over The First World, Earth. He creates an assassin called Beast and together they intend to kill the Pharaoh of Egypt and take his throne. They succeed and the disguised Sett Ra takes over as king. But the Pharaoh's son, Ahmet, is not so easily deceived and together with his grandfather and a coven of wizards, they send Sett Ra back to The Second World, bandaged mummy-style and imprisoned in a rune-encrusted pyramid. Beast frees his master and they set out for revenge. But to end his exile from The First World he must perform a ritual on the descendant of Ahmet, Beast finds the child and all is set for the final battle. Only the Chosen One can stop him now. It still doesn't explain what a basketball player is doing in a beat-'em-up though! Well, apparently it does because 'Shaq' happens to be 'the chosen one', the one who possesses strength, courage, agility, spirituality, intelligence, martial arts skills, etc, etc. And luckily for mankind, Shaw just happens to be on his basketball tour in Tokyo which just happens to be the right place at the right time... Contrived? A little! Over the past few months we've seen many beat-'em-ups arrive on the Amiga, varying from the good, the bad and the downright atrocious. Mortal Kombat 2 is now one of the best beat-'em-ups we've seen on the Amiga so far, with its excellent, gory graphics and tonnes of playability. Then there was Gremlin's Shadow Fighter, again a highly addictive addition to the genre. And how could we forget Rise of the Robots, which showed what could be done graphics-wise, as long as playability isn't a priority! Shaq Fu sits somewhere horribly in the middle. It's not the worst beat-'em-up on the planet, but compared to MK2/Shadow Fighter/Body Blows? Well, it's like comparing your little scooter to a fantastic Harley, or a transport caf' cheeseburger to a roast beef platter. Need I say more? Shaq Fu just isn't up there with the big boys. Sound is limited to an uninspiring, and rather grating, introduction tune which does little to generate atmosphere, and the in-game effects are nothing more than the occasional weapon clash or yelp of pain. The punching noises are pretty feeble too. Mortal Kombat 2 has a good range of samples, as does Body Blows Galactic, and it's a shame that something with a little more depth could not have been used here. The graphics are neither particularly bad nor good. This may sound like a case of 'fence-sitting' but it's true. The backdrops don't stand out as being all that spectacular. They do their job and are unobtrusive, which means you can concentrate on gameplay, but they don't really provide much atmosphere either. The animation of the sprites does work quite nicely though. Their moves are fluid and look convincing as they bound around the screens. The sprites are smaller than usual which means a lot of detail has been sacrificed and it takes some getting used to. Also, the characters themselves don't really come across as menacing - they don't look as if they could ransack a kiddies' playground, let alone The First World! As every gamesplayer knows, playability is the all important factor in any game and if there are no distractions such as fancy graphics or sound then when playability is not up to scratch it sticks out like a sore thumb. This is the case in Shaq Fu. Control of the fighters is more frustrating than it should be. The controls are not intuitive and the moves are fiddly to operate. Some of the fighters can perform magic - if that is what all this pointless white screen flashing is all about - but this prevents you actually seeing what's going on for a few seconds, and all you can do is wait for your opponent to come over and punch the crap out of you. Adding to the 'cringe factor' are the awful cliché sayings of the fighters such as threats to "slap you silly" or "I am too smart for your foolish style". It doesn't add anything to the game and it certainly doesn't provoke you in to a violent frenzy. Another total waste of time is the ridiculous amount of disk swapping involved. There are six disks and before each fight you are subjected to a lengthy and most anoying process of changing disks several times. And it's not hard disk installable either, which is pretty unforgivable when the loading time is equal to the amount of playing time you get. Unfortunately, there just isn't anything new or original here to get excited about. Two-player mode is boring, at best, and the tournament varies beteen far too easy - because some characters need just one move to defeat them - and far too hard - for example, the characters that use magic result in you not being able to get near to defeat them. There is no middle ground and little opportunity for skillful hand-to-hand combat. It does have some good points - the characters move brilliantly, there are plenty of different modes to play the game in and there are many characters - but unfortunately the bad points outweigh the good. Nowhere near up to the same standards of other quality beat-'em-ups available for the Amiga. Not even close. Shaq Fu has been translated from the SNES and has lost definition and colour along the way, but can it give the rest a run for their money? Shaq Fu is one of those beat-'em-ups that could have been good. Very good. Unfortunately, because it's been converted from the SNES it suffers from some rather nasty side effects, verging on a hangover. For a start, it comes on six disks and demands an inordinate amount of swapping every time a new character or bout is opted for. This would be just about acceptable if the game was as good as Mortal Kombat 2 or Shadow Fighter (four disks). But it isn't. The characters are horribly small. Much smaller than on the SNES, to their detriment. You never feel completely in control even though the controls are easy to get to grips with. The software even makes allowance for owners of two-button joysticks, which is a good thing. The special moves are inventive and novel but you never feel as if the damage being handed out is really making the opposition suffer. And if there's one thing that's important ina beat-em-up, it's the feeling that you're handing out max hurtage. It's a shame because the sound does a good job of backing up and complementing the on-screen action. Whooshes, aarrghs, and skull-fracturing inertia-laden contact sound jusst about perfect. But it's to no avail. Still on the plus side, there's a cookie plot that just about manages to carry the game. It's sort of like Yie Ar Kung Fu with a pointlessly silly map thrown in to cover up the fact that it's just a simple selection screen. You take on the role of Shaq and you've got to fight your way through all of the fighters until you meet the demonically evil Sett. Kill him and you've completed the game. Shaq Fu won't set the beat-'em-up world on fire, but it's competent and proficient enough and if that's what you're looking for, you've got it. Small. Loses clarity in conversion from SNES. Sonic sound sensation. Even better than MKII. It's addictive if you're a beat-'em-up freak. Let down by the vertically challenged graphics. He's a big bloke, our Shaq. (Mr O'Neal to you.) Very strange then that someone who's an inch over seven feet tall and weighs about 300lbs (or 21 stone in old money) ends up in a beat-'em-up looking like an ineffectual midget. This is presumably a device to make his opponents in the game look really tough and imply matches of great challenge, whereas of course in real life Mr O'Neal would simply crowd them into a corner, tower over them menacingly and kick them in the head until they died. Every game has a gimmick. Shaq Fu's is that the graphics have been digitised using a method called 'motion capture' which appears to be digitising but with a special name. It's an impressive technique which does indeed lend the animation a 'human' quality. Unfortunately, with such a large number of animation frames the characters need to be small in order to move quickly, and even then the game misses out the odd frame in order to place you in the right area doing the right thing at the right time. It all works though. Just. Sort of. There's a comical plot to Shaq Fu. So comical in fact that I have reserved a special place in the review to explain it. Essentially it's you versus everyone you meet as you travel across a landscape in another dimension looking for the exit, but at least you can choose who you want to fight. There are three sections to the map, with about five or six locations and fighters in each. You can visit the locations in any order you like, and once you've completed them all a magical bridge appears to take you to the next section. A good idea, methinks - it breaks up the monotony of fighting the same character until you beat him, and also gives you a feeling of (slightly) controlling what's going on. If you can't be bothered with all this though, there's the usual two-player mode and a tournament option for three to eight people. And that's the information out of the way. In the fine tradition of the mighty beings of AMIGA POWER, I don't really enjoy beat-'em-ups unless they're a bit special. I dislike Mortal Kombat 2 for example, because of the tedium of getting the moves working, and enjoy Virtua Fighter because of its accessibility. I didn't enjoy Street Fighter 2, for instance, because of the tedium of getting the moves working, and like Shadow Fighter because of its accessibility. There's a pattern developing here. Shaq Fu has a few good features to it, but the 'feel' and the way it handles combos (the lifeblood of a decent fighting game as far as I'm concerned) are nothing short of shameful. The basic moves all work as they should do, and thankfully the special moves are straightforward enough to execute, but when you try to throw them all together into a cohesive attacking combination, it all goes horribly wrong. Let's say you want to punch someone and then move back so you can jump in with your special move. Although you can do all these things separately, trying to combine them means everything apart from the initial punch will fail. Even your fastest move (the back flip) can't move you back quickly enough, and the distance you jump is way too long in relation to the characters. By the time you've got to the right place to pull off your special move, your opponent is either on the other side of the screen or has thoroughly beaten you up. The keys to success in Shaq Fu are either to get in a few quick hits and then bide your time for the rest of the match, or to trap your opponent in the corner of the screen and, er, kick him in the head until he dies. So much for the foundation stone of beat-'em-ups: that YOU SHOULDN'T BE ABLE TO BEAT EVERYBODY WITH ONE MOVE. Nngh. With Shaq Fu, it's the old story of playing on automatic just to see what happens next. (In this case what absurd thing the next character will say as he lies crumpled on the floor.) I don't wish to keep harping on abut a particular game, but you'd be barking mad even to consider buying this when Shadow Fighter is on the shelves. Every beat-'em-up needs a convoluted plot. Well, actually it doesn't but Shaq Fu got one. And not only that, it's got a crap one as well. But instead of me wibbling on about it for a couple of hundred words, let me put you through the same torture the game does. Ha! 1: "It's downtown Tokyo and I'm checkin' out the local sights on the day of my all star charity game when..."
2: "...I stumbled upon a small Kung Fu dojo with an old man inside..."
3: "Greetings big warrior. You are the one from the stars, I presume? I thoght I'd never live to see the day!" 4: "I'm an all star if that's what you mean? We have a game tonight... would you like to come? It's going to be quite a battle even though it's for charity. 5: öh no, young warrior. I'm too old to be fighting! But I wish you well... you must hurry now if you are to save the little boy Nezu. That is, if you really are the magic one?" 6: "Not sure what you mean? I'm just sightseeing before my game. What are you talking about?" 7: "No time to explain! Go through this portal - find Nezu - and save him before it's too late." 8. "Somewhere in the Second World, Beast brings his skeleton soldiers to life." UPPERS Choosing your next opponent in the story mode is a good idea. The accessibility of the moves (special ones included) means it's easy to get started with. DOWNERS But there's something seriously wrong with the reaction time and judgment of the whole game engine that causes everything to go horribly wrong once you start actually fighting anyone. A very flawed game engine and too-small, if impressive, graphics, spoil what might have been a ecent little beat-'em-up. Is there any difference? Not one (except of course it runs a bit faster). C'est la vie. A beat 'em up starring a basketball superstar? That doesn't quite fiture, so we sent in the dumpy legged Rik Skews to investigate. When someone weighing 300lbs and is over seven feet tall decides to be in a beat-'em-up you'd think twice before telling them to go away. But when that person is Shaquille O'Neill, arguably the most successful sportsperson of all time with a salary that would make the £18 million lottery winner jealous, you'd be committing financial suicide not to sign him up, however ridiculous the premise. Developed by Delphine, a company well known by Amiga owners for the excellent Another World and Flashback, their distinctive graphical touch is obvious from the start as the sprites are equally well animated and dynamic. The plot is not so polished however, and takes into account just about every beat 'em up cliché imaginable. It takes place long ago in The Second World, a miserable land ruled over by the heartless Sett Ra. Not content with ruling The Second World he wants to get his gnarly fingers round that sticky bun called The First World, better known to you and I as Earth. Of course only the Chosen One can stop him doing so, and unsurprisingly this is Shaq Fu. Into the game then and one of three play modes is available. 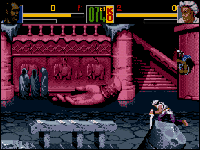 Story mode casts the player as Shaq Fu, who must wander across the game map battling each of Sett Ra's cronies in turn, while Duel allows any of the characters to be pitted against each other in either a one or two player match. Finally there's the tournament option, similar to that seen in Ultimate Body Blows, where each player assembles a team of fighters before sending them in against the opposition one at a time. Whoever has the most surviving fighters at the end of a battle wins. So, the presentation is good, with comprehensive options, and the graphics are equally polished. Why the low mark, then? For starters, abominable disk accessing. Arricing on six disks Shaq Fu takes an age to load, and that's just to get to the title screen. Once the characters have been selected, up to four more disk swops are required and unbelievably if you lose and decide to play the match again, the whole set up must be reloaded as it isn't kept in memory. And while the sprites are detailed and well animated they are wholly unsuited to the beat 'em-up genre because of their small size. Letting loose with an explosive fireball for example should look exciting, instead it looks more like a spray of air freshener. And sometimes in close combat it can become very difficult to sort out what's going on. This leads to pointless random stabbing of the joystick button as you try to bash down an opponent's energy bar before they do the same to you - not a good way for developing skill or strategy. Shaq Fu also suffers from many of the characters having just one move which will destroy an opponent with little effort. Shaq himself has a nifty throw which does just that and the other character most likely to be selected, Beast, has a claw attack, which does the same. The unresponsive controls also lead to simple moves being used most often as the special ones are too difficult to pull off. Although many of the character's moves are hidden, if you've played Streetfighter 2 or either of the Mortal Kombat games most of them will be worked out quickly. Not only have the moves been seen before their execution has too; fireballs, dragon punches and overhead throws are common. Shaq Fu is not a product that can be recommended. Although disk swopping is a problem, the insipid and completely uninspired gameplay that's been too accurately converted from the equally unimpressive Mega Drive and SNES originals is the major flaw. It's important for the Amiga to get big name console conversions like Aladdin, but this is one title that should have stayed on cartridge ROMs. The Amiga used to have little in the way of decent beat 'em ups but not anymore, so stick to Acclaim's classic Mortal Kombat 2 or the forthcoming Shadow Fighter from Gremlin Interactive. Nice animation. Terribly gameplay. Pity. Im Standard-Schlagabtausch mit "Shadow Fighter" hat der Basketball-Star Shaquille O'Neill erst letzten Monat den kürzeren gezogen, nun versucht er es im AGA-Ring - und erweist sich auch hier als unumgänglicher Bursche. Tja, wer nicht hören will, muß fühlen. Und das Hersteller-Trio aus Electronic Arts, Delphine und Ocean wollte nun mal unseren Hauptkritikpunkt an der 500er-Fassung nicht ausräumen: Selbst am A1200 oder dem 4000er kann das sechs Disketten umfassende Game nicht auf Festplatte installiert werden - und wer nur mit einem Zweitlaufwerk antritt, darf fund vier-mal die Scheiben wechseln, ehe der erste Zweikampf über die Bühne geht! Na, immerhin waren Optik und Gameplay inzwischen auf der Schönheitsfarm, wodurch die kleinen Sprites nun etwas bunter daherkommen und sich bei nach wie vor sehenswerter Animation auch einen Tick schneller bewegen. Kicks, Hiebe und die (in der Anleitung leider nicht erklärten) Special-Moves lassen sich damit deutlich williger auslösen. Der Sound blieb dagegen ganz der alte, was auch für das Optionsmenü gilt - wie gehabt darf das Zeitlimit geregelt und zwischen Ein- bzw. Zwei-Button-Sticks gewählt werden. Danach streifen Solisten im Story-Modus über die Oberwelt und prügeln alle Gegner bis hin zum finalen Oberfiesling Scatt nieder, während gesellige Raufbolde sich mit einem menschlichen Sparringspartner duellieren oder aus dem Fighter-Dutzend zwei bis zu vier Mann starke Teams zusammenstellen.